I've not blogged for ages... sorry. I've not had a great deal to say for myself as I've had to put a lot of effort into my day job over the last few months. But recently, I've put a lot of time into my beading again. What I have to share with you tonight is a little experiment. 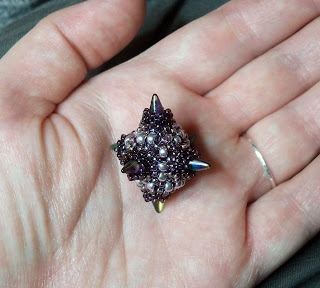 I recently bought some spike beads, in two different sizes, and I decided to sit down and play with the baby spikes this evening. These baby spikes are 5mm x 7mm, and they are coloured 'Magic Lilac'. The spikes I actually used in my beading were Magic Orchid, and had slightly more green to them, but they're just a beautiful. I had a pack of six of them, so making a six-sided shape was the obvious choice. 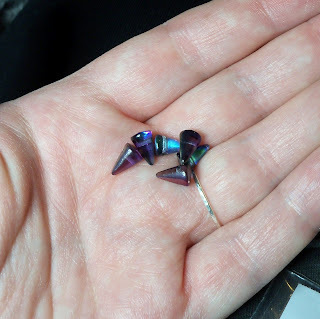 Initially, I started out small, but realised that that wasn't going to work, and that the spikes needed to have a fair number of beads around them if I was going to join them in a way that gave a strong structure; so the bezelling began! I started off with a ring of size 15s, then increased to 11s around each of the six spikes, then joined them using size 8s. I must admit, I didn't manage to do it quite in the way I had planned, but that was mostly to do with the bead-count. It turned out that I prefer the way I 'botched'! The corners needed reinforcing to strengthen up the structure, and then I had 12 threads to weave in (yawn!). I'm very happy with the finished result. A good beading friend of mine made my day by describing it as 'very Laura McCabe'. I couldn't have been happier as I'm going on Laura's beaded sculpture master-class in a months time... I'm still nervous about it, but I'm sure it'll be great fun! So, this is my little spiky ball of beads.... no idea what I'll do with it; it'll probably be added to my pile of 'beady somethings' on my desk. Awesome job...you should be very proud!! Well done mate - keep playing! I like that, Becs! I didn't know you were going to a Laura McCabe workshop - I hope you blog about it - her work is fantastic! 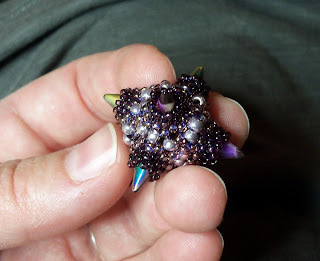 Make 4 more and a smooth dodechahedron bead, then play jacks! Can I just tell you how awesome this is? Awesome!